Ahead of the national referendum taking place next June 5th in Switzerland, basic income activists are aiming at creating the World’s biggest poster with basic income slogan on it. They need 180,000 to make it happen. An historical campaign is happening in Switzerland right now. While the whole country will vote on basic income on June, an unprecedented level of campaign activities, events and press coverage are happening. 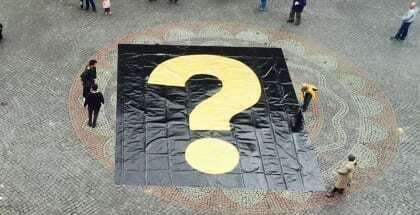 Now the famous Basel-based group Generation Grundeinkommen (Generation Basic Income) is taking the challenge to the next level by attempting to break the Guinness-World-Record for the largest poster on earth. The poster will be displayed in mid May. “We have several places in mind. One possible option is the Plain Palais in Geneva. This is a big space in the middle of the city with flea-markets and carnivals. It’s a space made for the people which suits our initiative.” The definite location will be communicated through their startnext-page. Big questions also imply big numbers. To make this happen, the organisers are pledging 180,000 euros on a crowdfunding platform. Already 100,000 euros have been collected thanks to 600 donators. They still need to cover 40% of their funding need (105k euros) by April 24th. To make the operation financially less costly and environment-friendly, the poster material will be manufactured into carry-bags and backpack afterwards. The campaigning group is experienced with large and successful street happenings. In 2013, they famously dumped 8 millions 5 pennies coins on the Parliament’s Square in Bern, which massively contributed to promoting basic income worldwide. If I had basic income I would expand on my garden designs for inner city parks and places of peace and beauty. Beautiful, healthy environments are important for the human spirit and deter crime.